Vegetative Description: Vietnamese edible variety is all green (non-variegated), unlike most ornamental “ex. Chameleon” varieties of the same botanical family. 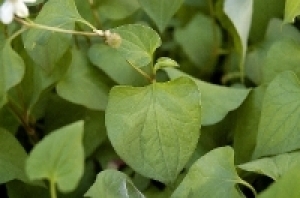 Leaf are slightly heart shaped, with small, white flowers. Tasting Note: Strong fish aroma. Culinary Uses: Not commonly used in American-Vietnamese restaurant dishes because of the bold fishy flavors. But it is very popular in home dishes of grilled meats, fish soup dishes. Also, usually eaten raw in herb noodle salads and fresh home-made fresh spring rolls. Propagation: Cuttings can be soaked in water to encourage root growth, then planted into soil. Spreads like a weed, so best grown in a container first. Log in | 72 queries. 0.218 seconds.